The team rushes to track down the mysterious gentleman whos been appearing in Lizs visions, as a slew of old enemiesfrom frog creatures, to the Black Flame, to the last remnants of Hyperboreamenace the Bureau from all sides in a catastrophic escalation to Armageddon. 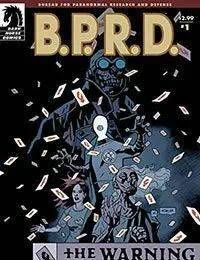 Written by Mike Mignola and John Arcudi and drawn by Guy Davis, this series immediately follows the events of B.P.R.D. : Killing Ground.